Gamification—or applying game concepts to non-game applications and processes—has been a huge trend lately, with dozens of gamified apps and websites now available to help you jazz up your routine. Zombies, Run adds a bit of fun to your workout, Duolingo lets you level up your knowledge of French, German, and other languages, and Khan Academy helps you practice your math skills. Gamifying apps and other programs add extra motivation while offering a visual way to chart your progress. There are also websites that gamify specific tasks, such as Habitica.com and Mindbloom. The former is a productivity app that mixes game rewards and punishments with a strong social network for motivation. 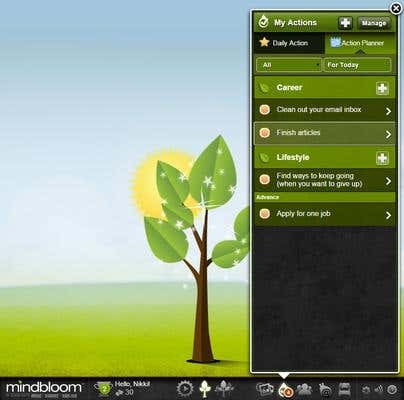 The latter provides a gamified to-do list, where completing your tasks grows a tree and levels up your avatar. Websites like Forbes have been talking about these games lately, and for good reason. There are articles about increasing productivity using gamification, getting employees more engaged, and countless personal stories of the benefits of using these sites. There’s no doubt that these games are a way of planning your life and incentivizing the completion of your tasks. The different columns allow you to plan different tasks. For example, to make sure I always have work lined up, I have a ‘daily,’ which reminds me to place a bid on Freelancer. Since I’ve already completed that task before, the color has changed to show that the task is one I do regularly. In the to-do column, I have one-time only tasks, like writing this article and updating my CV. The habit column allows me to reward myself for remembering to do something that I might want to do multiple times a day—for example, I have one for working for an hour. At the same time, I can plan anything else that’s coming up, and see it all integrated into one app. 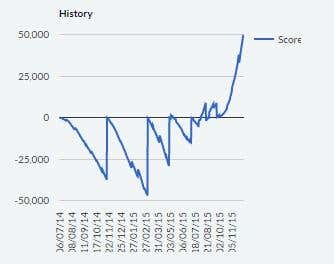 It’s amazingly powerful to be able to see your progress – here’s a graph of my to-do column, showing how my score has increased over time as I got things done. In addition to statistics and a task dashboard, the app also has other features that turn productivity into a game. By doing tasks, you can earn ‘gold’, which allows you to buy ‘weapons,' which in turn allow you to complete ‘quests’ that give you the chance to earn cute animal companions and achievements. In turn, if you don’t complete your tasks, Habitica exacts penalties: damaging your character, losing gold, and even causing character ‘death’ (losing a level and damaging a piece of equipment). Missing a deadline becomes the equivalent of falling off a cliff in a video game. Habitica has an app as well, so you can update your to-do list wherever you go. Whatever habits you want to foster and whatever tasks you need to get done, sites like Mindbloom, Habitica and SuperBetter can motivate you to do even your more unpleasant tasks. If that sounds too complex, even basic gamification methods, like keeping track of how many days in a row you remember to make bids on Freelancer, can be motivating -- you just need to beat your own score.